Worldwide, education budgets are getting slashed. 2017 saw major cuts to US training and education… with more scheduled in various industries in 2019. In fact, according to Office of Management and Budget, 2019 may see as much as “$7.1 billion or 10.5-percent decrease from the 2017 enacted level”. With no end in sight for budget cuts to education and training, instructional designers are placed in a difficult situation. How can we maximise our results amongst all these pressures? avoid getting your budget slashed by showing a real ROI with your training materials. Today’s scenario is “Eliminating Negative Habits” and we’re going to look into the how I made the scenario, why it’s a different/special experience, as well as what makes our platform better than other alternatives out there. Before reading, I’d recommend taking the scenario for a spin first. As we all know, staff training has a range of benefits: that’s true regardless of sector. Yang lists a range of benefits for different parts of organizations, focusing especially on hotels. For employees, it improves job satisfaction, encourages self-development and develops problem solving skills. For organizations, it improves profits and reduces both number of accidents and staff turnover. Like the starting the creation of any course, I started by scouring through training courses and articles from different levels and parts of the hospitality sector to understand what exists, what is needed and what we can do to help efficiently. After getting a lay of the land, I homed in on information regarding front desk training (since this is the area we really wanted to target with this scenario). Experiences that help build empathy are of key importance because your front desk staff are the first face of the company for the majority of clients. Having empathy can help front desk staff reach out to customers and provide an experience that goes a little further. (2) Allowing employees to experience the service from the other side (that of the customer). Getting employees to experience the customer’s side is invaluable because it lets them see things from a new perspective: letting staff understand the process through the client’s eyes, as well as finding potential problems that may have been overlooked. So how did these two key points (empathy and experencing the other side) grow into the unique scene you see now? How Did We Make The Scene Unique? In a previous scene (Effective Listening), Toni was introduced to the world. Her tone of voice is one of total apathy and I thought she would be the perfect host for our inn! Another upside was that I only had to tweak her outfit a little before adding her into the scene (saving a lot of time in character creation). This gives the scene a strong personality to help bring the learning objectives to life! (2) Making Toni as Bored as Possible! Conversation is great but adding gestures can really take your scene to the next level. Characters move more naturally and make the interactions more attention grabbing. I wanted to find as many bored, lazy actions as possible so I used the scenario guide to gestures to see them in action and take notes of my favourites. 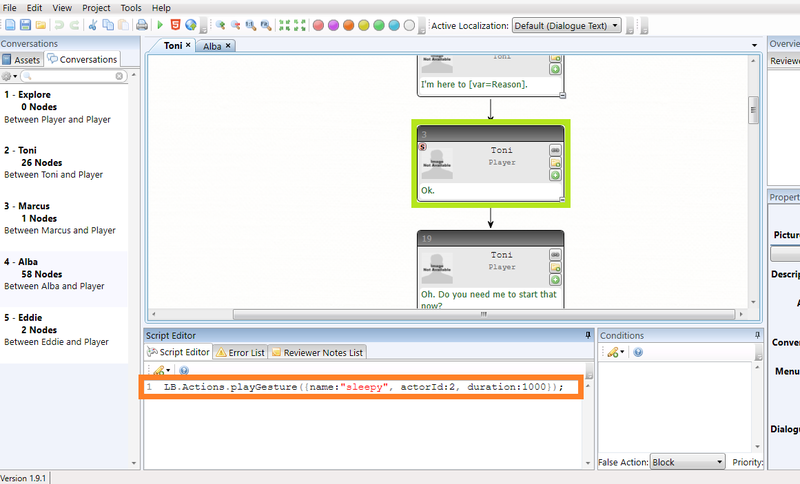 After choosing them; I simply added the code into the ChatMapper file. The next point was having a realistic hotel atmosphere. I like decorating the premade LearnBrite rooms but I thought it might be good to have a look to see what models were out there. 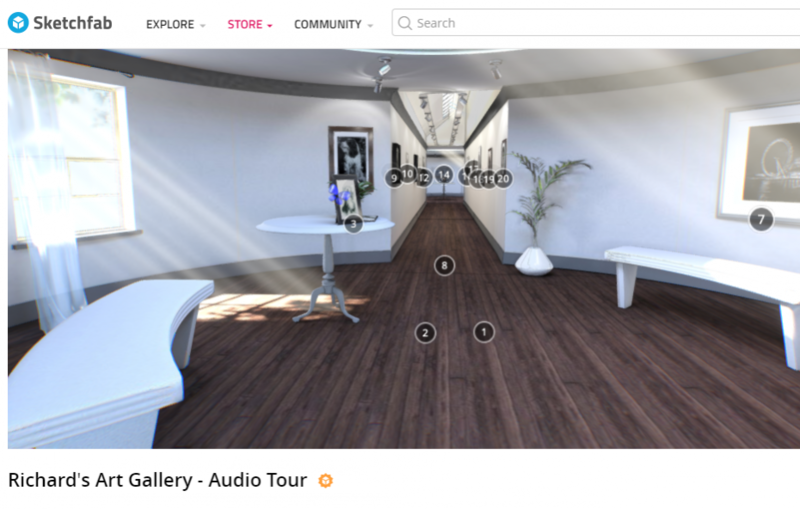 On sketchfab, I found this lovely gallery room that I thought would be perfect! After checking its attribution requirements, I packaged it into my CMPKG file to access it within my scene. To learn how to use 3D models in your scenes, check out our guides. 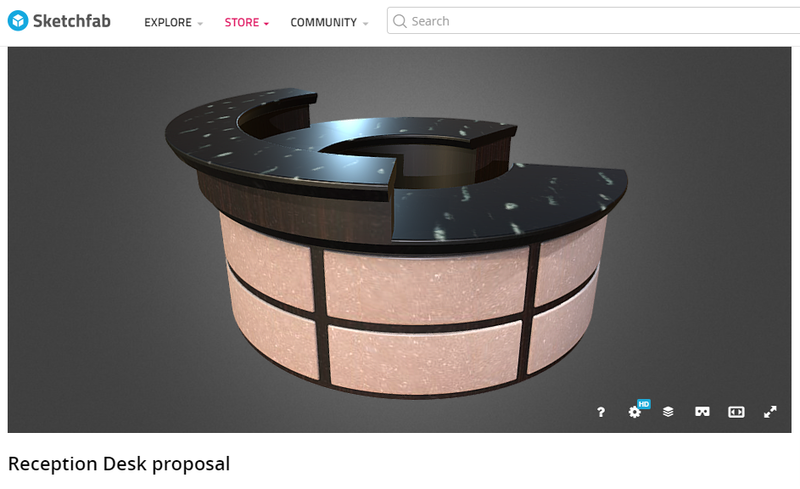 Again on sketchfab, this reception desk seemed like a lovely addition to help turn this space into a beautiful hotel lobby! These 3 key aspects helped me quickly add in variety and novelty to make the scene unique and engaging. Apart from the ability to make scenarios quickly and efficiently, what else makes the LearnBrite Platform special for us as instructional designers? Why Is LearnBrite Useful, Special & Different? With so many other examples out there, it’s important to focus on what makes ours special. LearnBrite focuses on Experiential Learning: a fantastic theory that can create powerful results. Experiential learning places huge importance on having students in the driving seat and evaluating their own (daily or learning) experiences to grow and learn from it. Following this theory, the platform allows you the ability to create safe environments that allows students to explore, discover and evaluate experience for themselves. Let’s focus on our “Eliminating Bad Habits” scenario to show this in more detail! How can a company recreate a check-in training experience in an engaging environment? They could use role play activities in their own hotel. However, this involves employees being checked in by their peers which becomes awkward and destroys the realistic learning environment that they are hoping to achieve. They could check-in employees into a sister hotel,but this is costly in terms of both time and money. The same problems exist for hiring actors. Our training scenario eliminates these problems: you experience a realistic, immersive and engaging experience, all with the added benefit of being way more cost effective. Not sure about you, but in my experience, keeping the bean counters happy and being able to show a clear ROI is always a must. A study by Sheryl Kline has found that many hoteliers are not demanding ROI information on their training. This is surprising because ROI shows the effectiveness of training methods and ensures efficiency of methods as well as usefulness in the real world. Traditional training methods include reading a company manual, watching a video or listening to a training seminar, all of which deliver information theoretically and passively. This can have the added disadvantage of creating a disconnection between the learned theory and the on-the-job practise. Cornford’s research into effective learning practises says that it is essential to “plan to integrate module knowledge with the workplace context”. Without this integration between learned knowledge and on-the-job practise, learning will be significantly reduced. Our training scenario puts learners in a realistic environment and lets them discover the theory in a practical way within the realistic environment. This erases any gap between theory and practise, putting Cornford’s findings into action! Right from the first task, our scenario puts the learners in an active position. It is simple: arrive at the reception desk and chat to Toni. However, it allows learners to choose between a direct route (through clicking on the hotspot and then directly on Toni) or to enjoy the place a little more first. 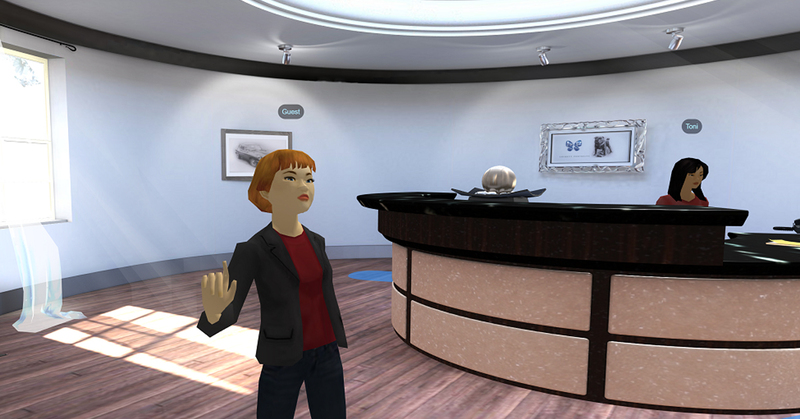 They can look around, see the photos on the walls, talk to different characters and move freely. This gives freedom and active choice. When you start the conversation with Toni (you need to initiate it, she doesn’t just start speaking), you see how she acts, reacts and engages with you. All of this actively builds up a personal experience for you as a learner. These all add into an active experience that Cornford’s research supports! Bobb Darnell expresses the need for learners to learn study (or “learning-to-learn”) skills to help them study more effectively. These learning-to-learn skills help learners understand how to take in, process and learn the information presented to them in a course. One of the five key points of learning studying skills is “Determin[ing] essential information”: understanding what is useful information and what is not. Most training courses list learning objectives so that learners can understand what is expected from them or what will appear in the course. However, according to Darnell, this could be harming a major skill that they need to develop for themselves. Our “Eliminating Negative Habits” scenario offers learners a chance to develop this skill for themselves. They need to go into the scene and analyse it themselves: what’s good, what’s bad and how they are affected. At no point, is there an objective or a place saying, “Don’t yawn in front of customers”. However, when Toni yawns, you understand how rude that is based on your experience as a customer. This active element of finding learning objectives is rare, even amongst other simulations or learning experiences. For example, watch the trailer for one of LobsterInk’s front desk training courses below and you’ll see they all involve videos and slides in order to transfer information. American Hotel and Lodging’s training video focuses on negative habits and spotting them: however it is again passive, watching a video and then delivers the answers, all at once, at the end. Our training session walks you through a check-in experience and then engages the learner to engage in a conversation to check understanding. This keeps learner’s minds open, active, questioning and analysing through the entire process. Normally, progress is measured with quizzes, percentages and/or points. However, we chose to include a normal conversation to check comprehension and gently nudge learners in the right direction (if need be). This is because some quizzes are very harsh (using loud sound effects, marking a full answer incorrect for only 1 mistake, using too many negative reinforcements) which can lead to students disengaging from the process. This softer approach is seen when the player is instantly directed back to Alba, the manager, after interacting with Toni. She asks some questions and gives the learner a chance to respond with how it felt and what problems there were. Some are correct, some are incorrect and others are personal choice (e.g. responding to “How did you find that?”). After incorrect responses, Alba corrects the learner by saying, “Not always”, “I didn’t see that”, “Are you sure?”. This keeps corrections constructive and gentle. without becoming weighty. All of this makes the scenario a place to engage with and receive positive reinforcement or constructive help, rather one that focuses on always being 100% right (causing some learners to disengage for fear of making mistakes). The LearnBrite Learner Experience Platform allows you to create scenes of any size but smaller is often better! They give information quickly and efficiently (as mentioned by Ayesha in her article about the benefits of micro-learning) and build into courses of bite-size chunks. Learners can dip in and out of when they need to removing the idea that there isn’t the time to study and train. Not to mention the added bonus of quicker loading times of each bitesize module! Our scene takes only about 5 minutes to complete making it a quick, yet effective, burst of information. Replayability goes hand in hand with repetition. To replay something, you repeat it. Repetition is a necessary part of the learning process. However, it is not always the most pleasant part! As APL explains, repetition is important because it helps a conscious action become an unconscious one. So what makes a repeating process fun or boring? What is the difference between things we want to repeat and things we don’t? Let’s take two examples: Candy Crush Saga and learning words for a spelling test. Both require repetition (Candy Crush asks you to swap candies, learning words requires reading/writing). However, Candy Crush saga has been voluntarily downloaded over 22 million times on Google Play Store alone. Meanwhile, spelling tests don’t have the same appeal. Reviews for the app give us the answer: “I love the game”, “fun” and “super addicting”. All the players are engaged and enjoying the experience. Creating an experience that learners like and are engaged with will let them repeat and replay it again to learn more. So how can we make our learning scenarios a more engaging experience for our learners? One good option in games is to hide information. By hiding information, a player has to go into a game and find what they need. When they don’t find something, they return to discover it again. With our scene, all of the learning objectives are hidden and waiting to be discovered. If a learner doesn’t find everything the first time round they can replay the scene like a game as many times as they need to! … all of this combines to create a stress-free environment where learning is encouraged and mastery is counted as a true understanding of the situation (rather than cultivating an atmosphere where excellence is valued through high marks on a theoretical test). We are all feeling financial pressure these days, and companies are no different. One of the first places to be hit is the education/training budget to try and minimize losses. We, as instructional designers, need to perform better with fewer resources, which is no small feat. We need to please the learners who are following the courses as well as management who are deciding about our future funding. The LearnBrite Learner Experience Platform gives you the power to put learners in an active and engaging position right from the beginning. They can choose how to react, where to go, what to do to. A fun and visually attractive environment stimulates learners to dive in and then they are in charge of their learning. On top of this, this can all be done at a fraction of the cost and risk that other training options do so. In the case of “Eliminating Negative Habits”, we have focused on building empathy through putting staff in the customer’s shoes. Building empathy is important because your front desk staff are the face and the problem solvers for their establishments. Using the LearnBrite Learner Experience Platform will help you grow a workforce that not only knows company protocols, but have also been trained to think for themselves and problem solve. What Makes This Better Than ‘Traditional’ Slide-Based Learning? No matter how nice the slides look, it is still a passive experience. No matter how much fun it is to watch a video, it is a passive experience. But, actually getting the learner to experience a scenario, make decisions that have consequences & deliver the learning through doing may just be the holy grail. That is why our method is so powerful. It places learners at the centre of the issue so that they can experience it personally. Are You Ready To Take Experiential Learning For A Test Drive? Our platform lets you create scenarios that encourage active learners, able workers and great problem solvers! Passive methods are less effective while our platform is economically efficient while delivering active experiences that build problem solving and teach key learning objectives. They can be built quickly and simply and in a way to suit your company, learners and course. Want to try for yourself? Start a free trial now! Hi! I’m Hannah and I’m an instructional designer. My career started as a TEFL teacher and I spent over 5 years teaching for all ages and levels around the world. As an avid gamer, I love problem solving and therefore I always found myself analysing what learners need and how to adapt materials to let them achieve their goals. This lead to a natural transition into instructional design where I now create materials for a range of purposes and needs everyday!